Even if you’re more of the latter, you’re going to want some sounds when everyone wakes you up at midnight. Or maybe you’re looking for a craft for your party, especially to keep children occupied? 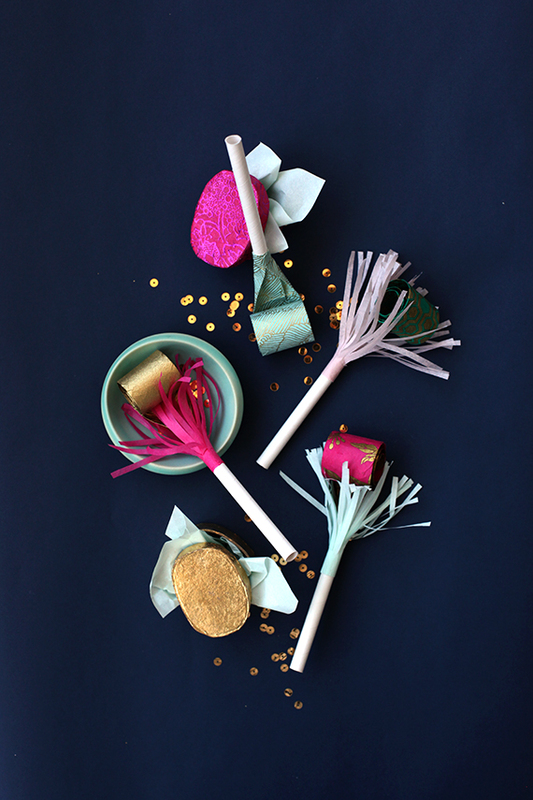 You’ve got a little from both columns with these DIY party noisemakers, starting with star wands. 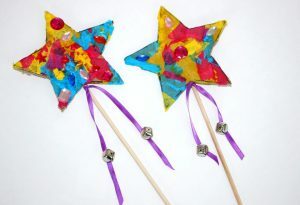 Using the magic of star-cut cardboard, potential fairies or wizards may then wield their glue brushes to begin crafting. Whoosh! -they paint glue all over the surface and adhere tissue pieces and jewels. Ding! 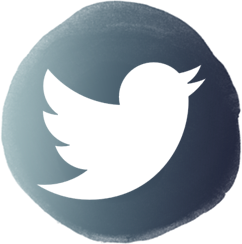 -they add a dowel tied with ribbon. The desired noise part of the noisemakers lies in the two suspended bells, at either side of the glued-on dowel. 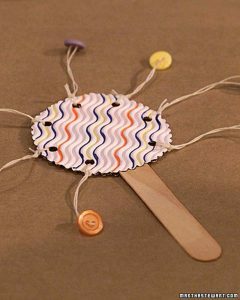 If you’re out of bells, your star-cutting skills are lacking, or you’ve got a bunch of craft sticks to get rid of; try these round noisemakers, instead. 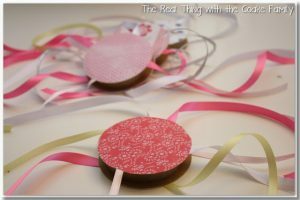 They’re pretty simple (possibly the simplest of all the DIY party noisemakers), especially if you use a plate to help trace the circle. 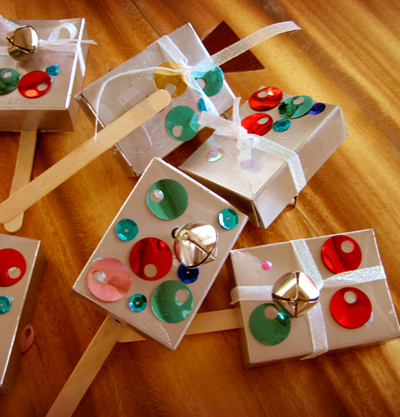 Buttons create the music for these, which are (fortunately) not so loud in the hands of exuberant children. 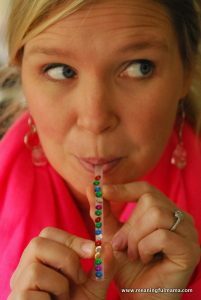 Jodi at Meaningful Mama imagined up a simpler instrument for partying: a straw. She and her family cut the ends at angles; then had a blast glamming them up with jewels, glitter, and glitter paint. Longer straws are a tad harder to blow through, she warns, but also said they had fun trying out different lengths. This looks like some bad props for a movie about 2013, but they’re really various container-instruments for New Year’s Eve. Instead of tossing your cleaned recycling, save a few tissue boxes or medicine bottles. Go all out with decorating the outsides, while filling the insides with rattling materials. DIY Inspired used bottle caps, dried noodles, coins, and paper clips as fillers. 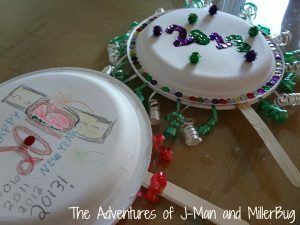 Speaking of rattles, have you or your kids ever made some with two paper plates? 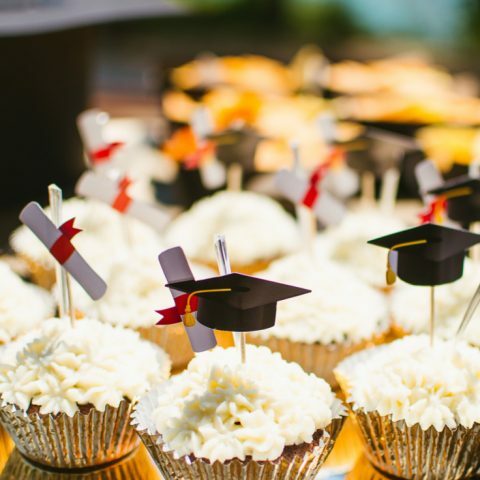 That’s the genius behind these, plus some highly-artistic painting and ribbon-placing. 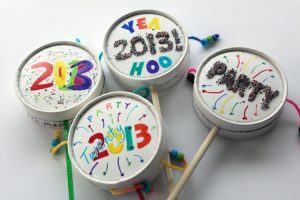 Shake, rattle, roll with these brilliant DIY party noisemakers. Yep, this is a Solo cup. And, it is the king of DIY noisemakers. 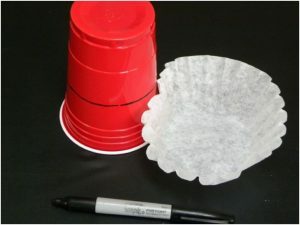 All this craft requires is two of them, a coffee filter, scissors, and five pennies. One cup will be cut down to match the sides of the filter, then placed with that filter inside the other cup (after you stick the pennies in). That’s it! My family always bought a pack of blowers when we celebrated. I would have been so excited to learn I could make my own! That’s just what Julep has done for me, with step-by-step instructions. 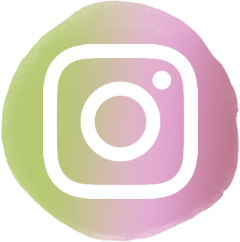 The necessary materials include patterned paper, a paper straw, a rubber band or clip, and crafting supplies. Find them at Michaels! 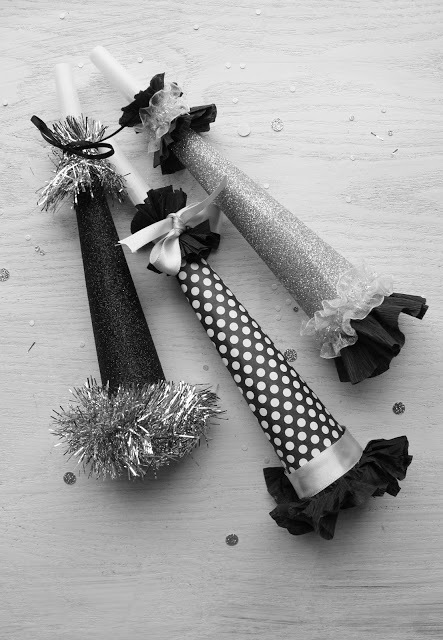 I’ve got another recycled materials project for you with these ribbon noisemakers. The funny part is that they are made from empty ribbon spools, which you may have after unwinding a bunch to decorate them! Looking for the part that makes noise? 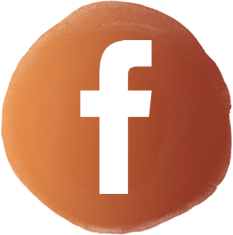 Glue a paper circle on one side, then carefully dump in some uncooked rice or beans. Glue another circle on, and allow to dry. Voila! More DIY party noisemakers. Remember how I mentioned taking a little from both columns? 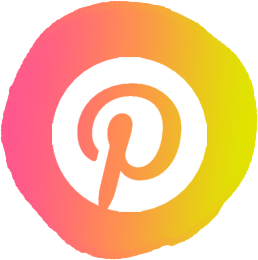 Worth Pinning‘s done just that with her idea. These are the BEST homemade idea on here, because they have beads for drumming the outside, plus candy to rattle along inside. Candy?! Yep! 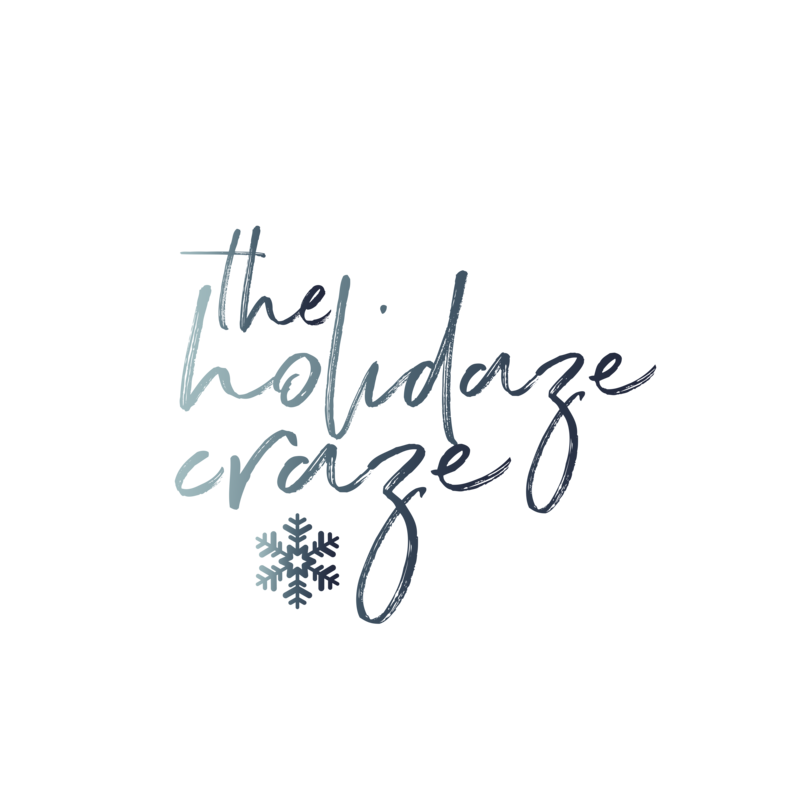 Their creator suggests kids can crack their noisemaker open for a treat, after shaking in the year. Another great party prop are horns. They’re super easy to make, too. Icing Designs cheated a bit by cannibalizing existing party horns. Her cardstock and frills are way cuter, though. 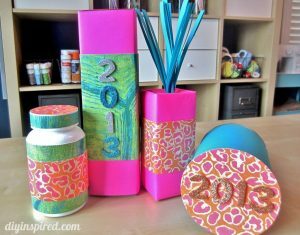 This is a great way to ensure all your party stuff matches, or for guests to personalize their own. Our last idea is a bit of a combination one as well; with beans or rice in the inside of painted, empty raisin boxes. A bell is attached to the outside, along with all those gorgeous accents the underage crafting artists will stick on. They’re held (and shaken) by a popsicle stick.